for loop attachment – cut 1 piece 14 “ long by 1 ½ inches. Stabilizer – 1 piece of fusible batting or Craft Bond cut 3 ½ by 5 ½ inches. rectangles – press according to package directions to fuse in place. 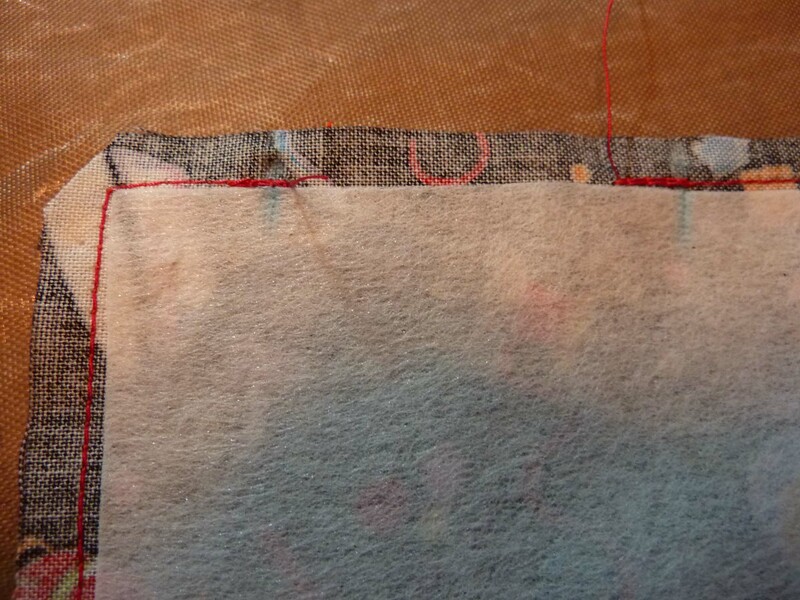 Place fabric rectangles right sides together and stitch with 1/4 inch seam around perimeter leaving a gap of 1 and 1/2 “ in the middle of one short end. You will use this gap to turn the tag and to insert the ends of the loop. Press loop piece in half (the long way). Open it up and press each side toward the middle. Then fold in half lengthways. Edge stitch both long sides. Trim corners and turn the tag inside out through the gap you left so that right side is now on the outside. Push corners out neatly and press. TipTime: I have found that a wooden chopstick is helpful to poke those little corners out without going through the fabric. Insert raw ends of loop about ½ inch into the gap you left. Top stitch around perimeter of the tag. Double stitch the area where the loop is inserted to make it extra secure. Place vinyl piece in center of tag. Sew 3 sides of the vinyl using a longer stitch than normal. I set my Pfaff at 3.0. TipTime: If you use too short a stitch you may cause the vinyl to tear. TipTime: the open end of the vinyl should be pointing toward the loop to make it more difficult for the ID card to slip out. I bought my vinyl in the home decorating department at JoAnn’s You’ll want one that has some body to it so that it will hold up better.. 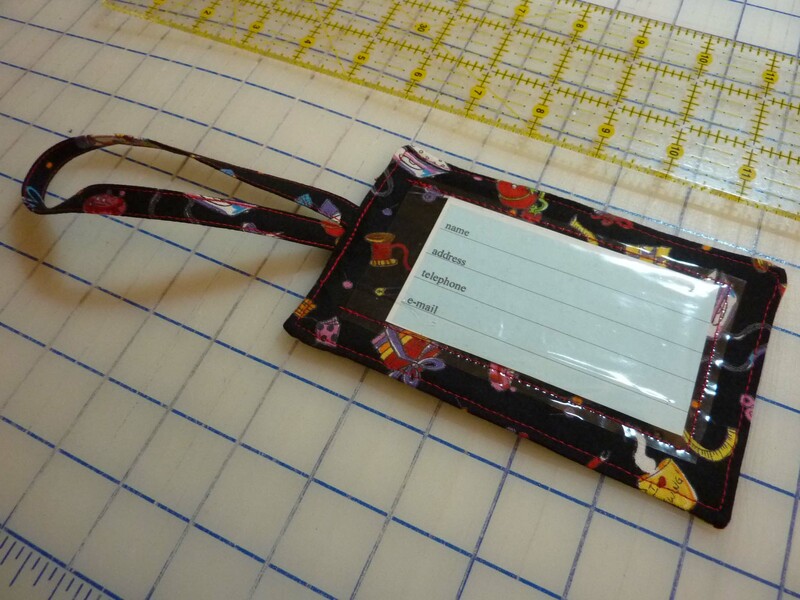 I made ID tag inserts using Print Shop – A regular size business card will fit nicely. These directions and images are the work and property of Guila Greer and may not be reproduced without permission. Faber Castel’s Design Memory Craft – all the details!. For my first effort back at fabric dyeing after a long break I decided to do some experimenting and to use up fabric that was in my stash, left over from other projects or who knew what? So I ended up with a stack of Mystery Fabric. 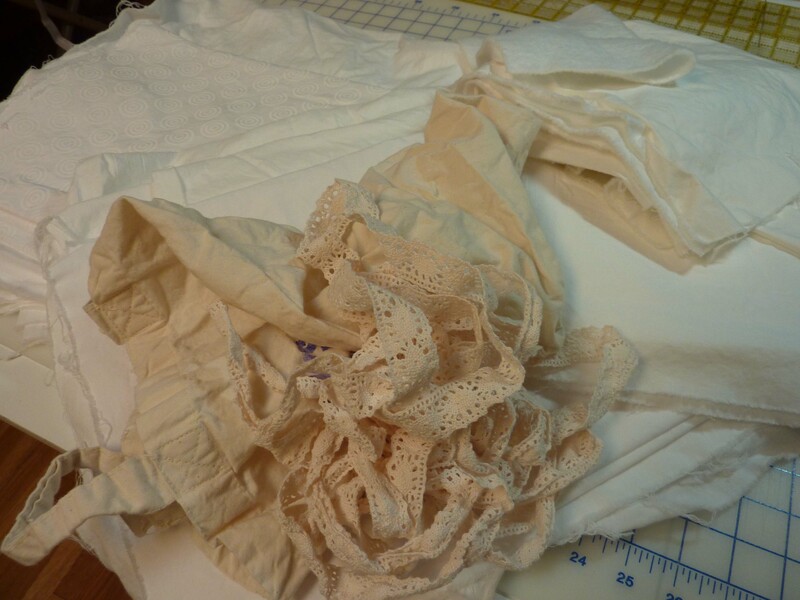 A couple of pieces were obviously muslin, the rest either Kona cotton or Pimatex. Just for good measure I threw in a piece of (I think it’s cotton) lace and some cheesecloth. 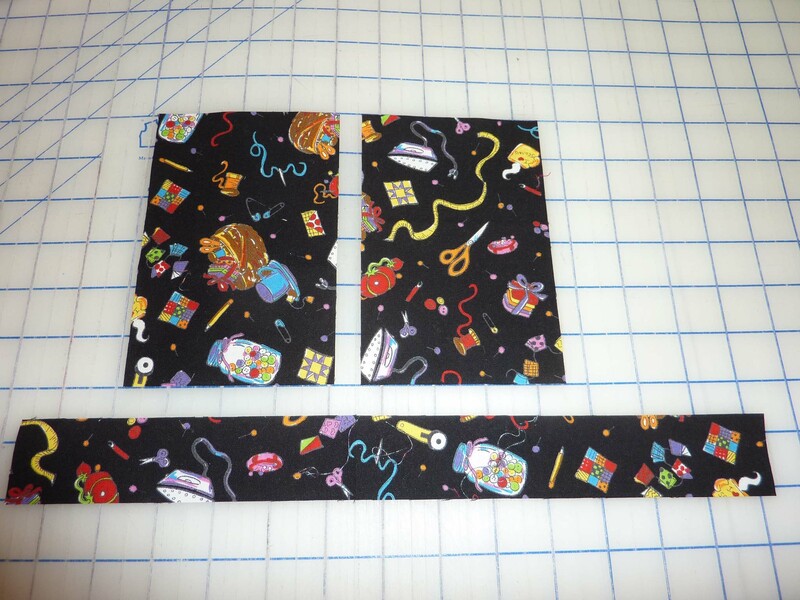 I cut the fabric into fat quarter size pieces. To gain some kind of ability to measure results against predicted results in the instructions, I carefully labeled each piece of fabric. I used a Pitt pen on Tyvek and stapled the label to a corner of each piece. Not only didn’t I know WHAT the fabric was I didn’t know if it was PFD or had been pretreated. So it all went in the washing machine and enjoyed a soda ash bath. 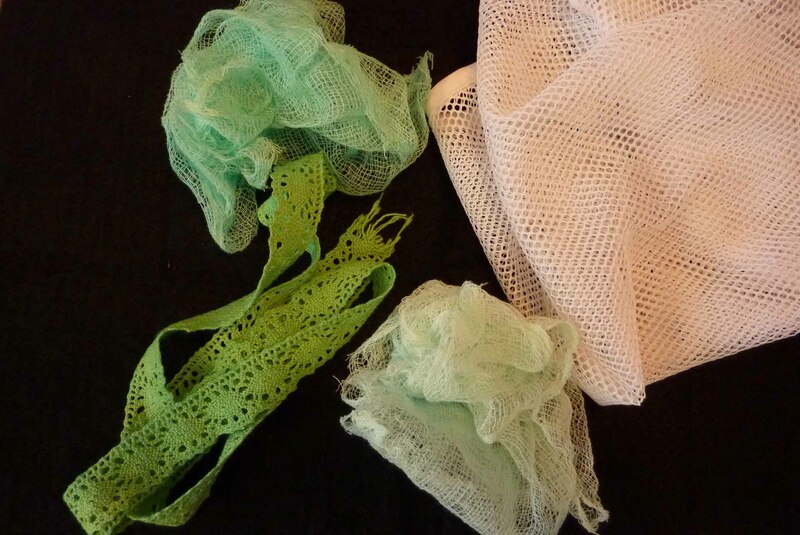 The lace and cheesecloth were included and were put into a mesh laundry bag so they wouldn’t get chewed up. My equipment was arranged on the counter. Helpful Hint It all came from the Dollar Store – and is stored away between dyeing sessions so that it won’t get mixed up with the ‘people’ utensils. Make sure you have a set of dedicated measuring cups and spoons. Plastic is fine – Do not use metal because of the chemicals. 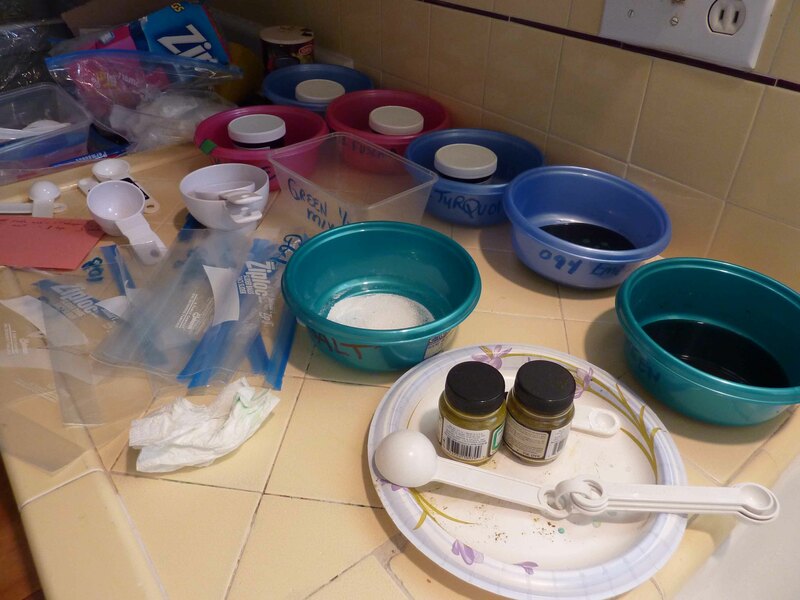 You will also need plastic bowls and stirring implements. Helpful Hint Make sure you carefully label everything. But don’t use a Pitt pen on your Tyvek – it came out in the wash!! Following one of the recipes in my guide book I mixed up a series of dye concoctions – each one a little weaker in color than the next. 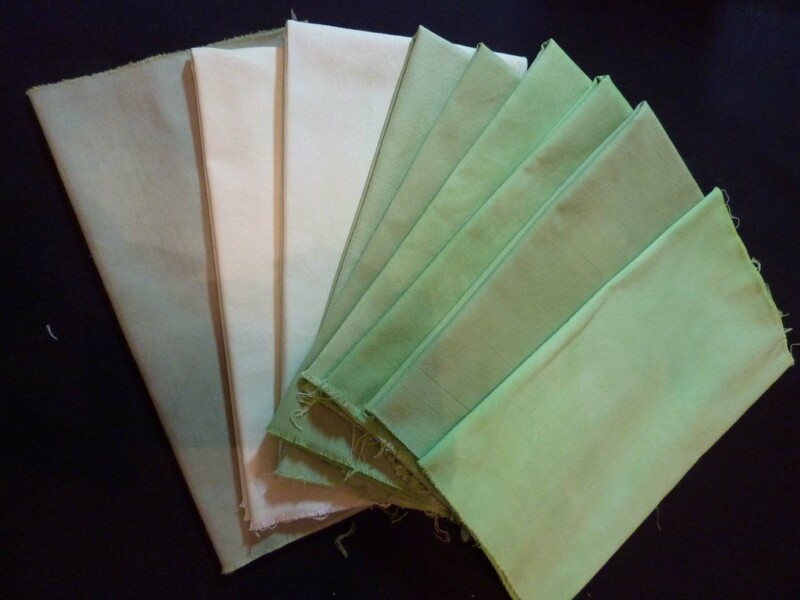 I wanted to end up with a variety of green fabric – envisioning some nice brights amongst them. Helpful Hint – I substituted colors – how much difference could it make? Right? Wrong! Don’t substitute colors if you want the results shown in your directions! Here is a photo of the fabrics enjoying their dye bath in tightly zipped up baggies. When I first put the fabrics into the baggies I smooshed them around so that they would get thoroughly exposed to the dye. I found that the biggest differences in this case addressed the soda ash bath process and the “steeping” time or “curing” time for the fabric. Previously I had used a 3 hour steeping time; this time I went with overnight. 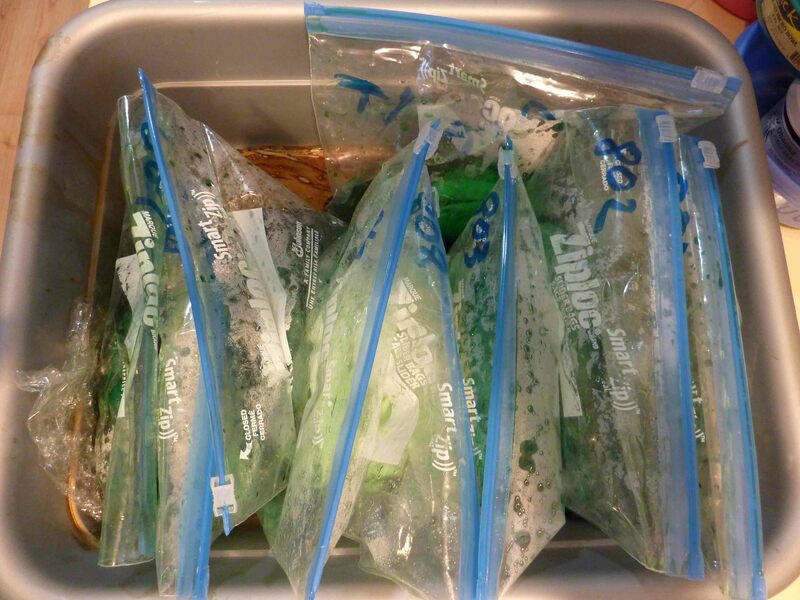 The next morning I removed the fabric from the bags, rinsed it under running water then washed it with Synthrapol. And here is the dyed fabric. Not exactly the Brights that I was going for but nevertheless a nice array of greens to add to my stash. Unfortunately all the numbers from my markers disappeared! I’ll have to try another pen next time. These fabric table napkins are becoming very popular and make a great gift. Here’s a quick tutorial for them. 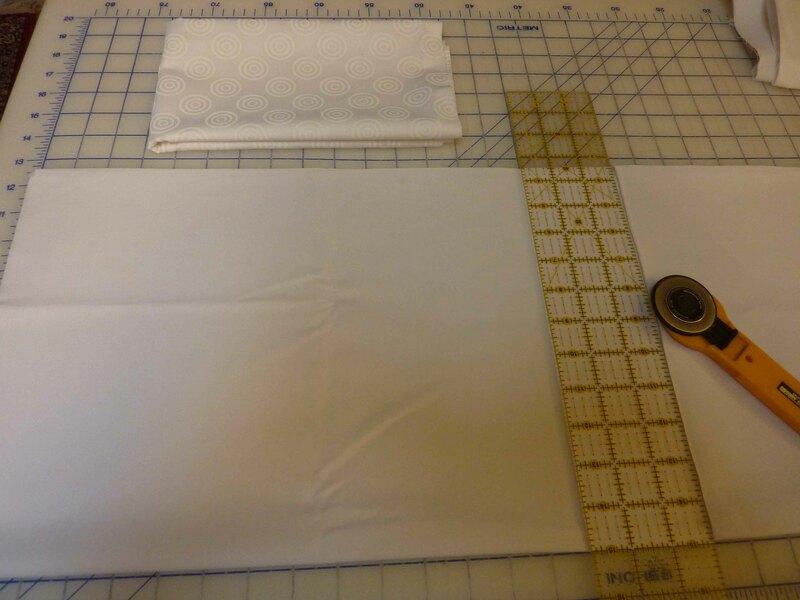 Cut your fabric the finished size of the napkin plus 1/2 inch. 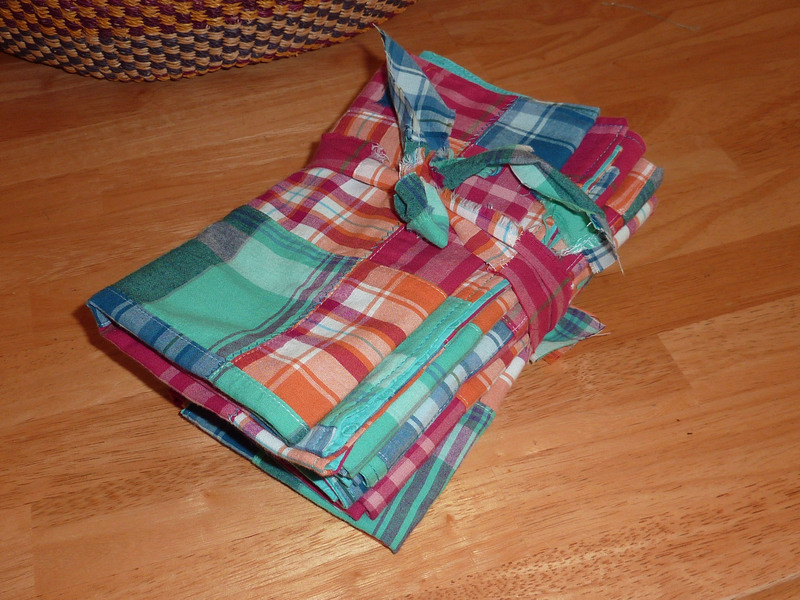 I think that I cut 16 1/2 inch squares for these – 2 squares for each napkin. 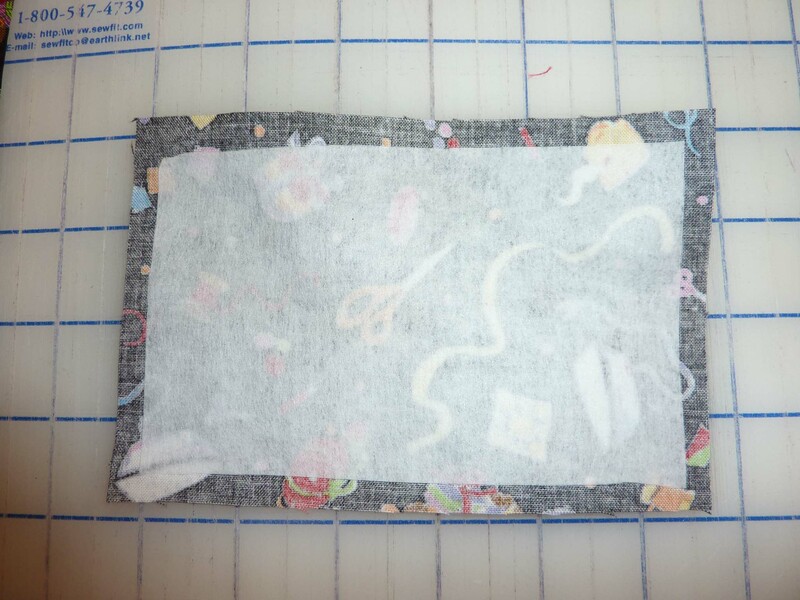 Note: You can easily get 4 single thickness or 2 double thickness napkins from a yard of fabric if it’s at least 36 in. wide. Most quilting weight cottons are between 40 and 42 in. wide. I like to use 100% cotton rather than a poly blend for these; feels good and better absorption. Consider the weight of the fabric when deciding whether to use single or double weight. Also consider whether you want double faced or single faced napkins. Pair 2 squares together RIGHT sides facing and sew around the edges with a 1/4 inch seam. Leave a 2 to 3 inch gap for turning. 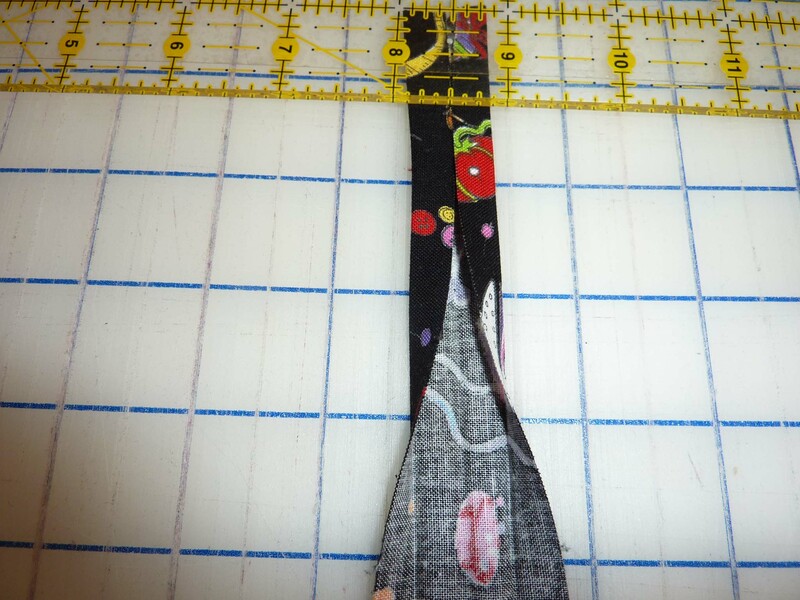 Turn to the right side – poke out the corners (a chop stick works nicely) and hand stitch the remaining opening. 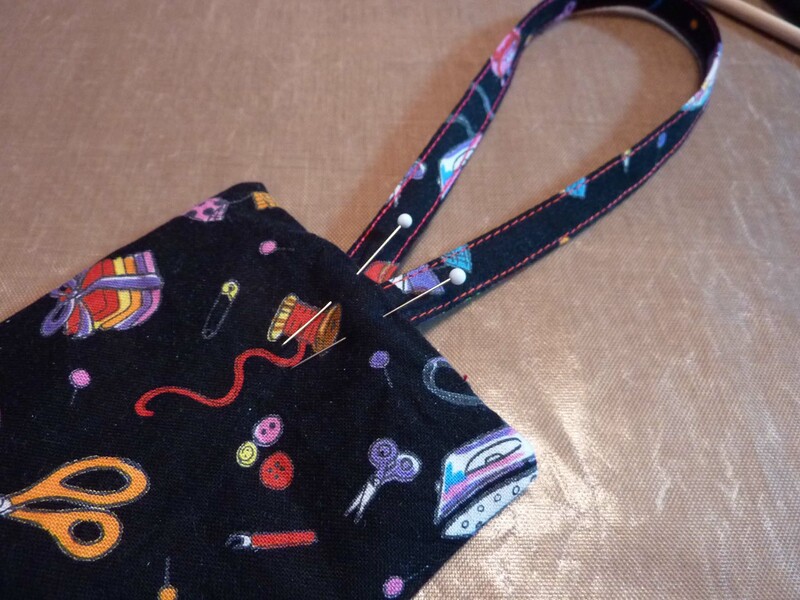 At this point you have the option of top stitching around the perimeter – and doing a couple of straight stitch lines across the napkin to better hold the front and back together. I bundled them together using a leftover scrap of the fabric. Cut 1 16 to 18 inch square for each napkin. 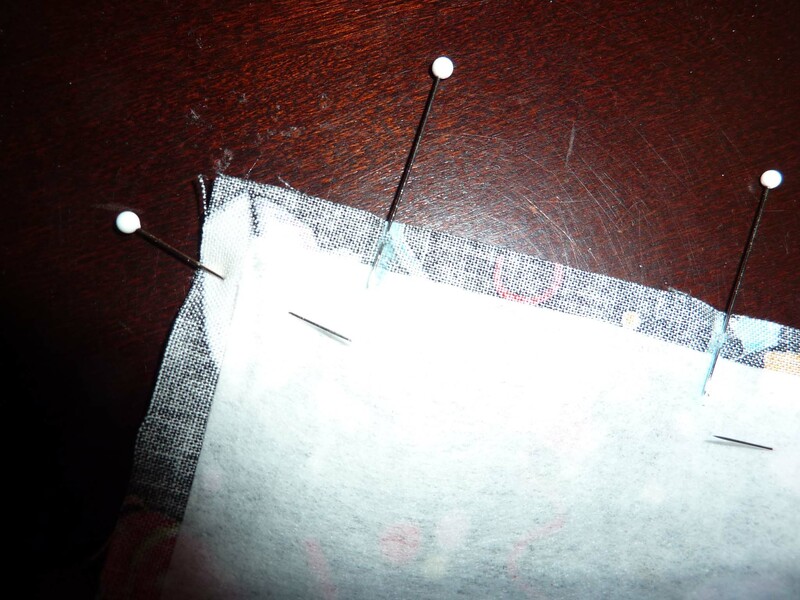 Use a serger to do a rolled hem around all edges.